Rinssor was ready and waiting at the dock at 7:30am to take Jackie and Brian to the airport. It was great having them join us. We have been trying to coordinate schedules for 4 years!! Jackie’s passport expires on July 14, I believe. They told us they didn’t have any problems with customs. We had heard horror stories about traveling with less than 6 months on your passport. Word to the wise. It can be an issue in some countries. I had Rinssor take me to church in his taxi. Then I caught the community church bus back to the dock. 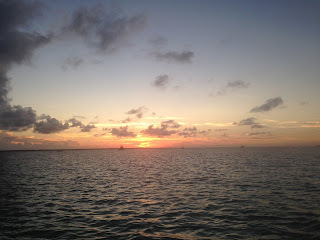 After I returned, we headed for Green Turtle Cay. We arrived about 3:30pm and had a relaxing evening. My back was much worse today. I started taking Aleve 3x/day. Dave was nice enough to do our laundry today. We will have free laundry once we are back in the states, so we thought about waiting. But there really isn’t any place to store dirty laundry. I spent some time on the computer, but ended up taking a nap because it felt better to lie down. Late afternoon, we decided we should go to shore for a few groceries and fuel so we could head further north in the morning. Dave wanted to drop me off for groceries and pick me up at the dock after getting fuel. We were afraid both places were going to close at 5:00 and it was 4:45. I was hesitant because of my back, but agreed. Getting in and out of the dinghy went ok. The grocery store is about one city block from the dock. When I reached the store, I found out it didn’t close until 6:00. So no hurry. I was fine until I reached to a shelf just above the floor for a gallon of milk. That almost made my back spasm. The store owners were very helpful. After I checked out, they found me a chair and let me wait there in the air conditioning for Dave to find me. Pretty soon, he showed up. The fuel took him longer than he thought. So he was glad I waited inside for him instead of at the dock. Once back at the boat, we moved to Manjack Cay, only about 5 nm away. It is a much quieter anchorage. Without a town or marina, there aren’t any power boats zooming past your boat.